"An apple a day keeps the...ah. No, never mind." After almost 9 months, Doctor Who returned on 4 January 1982 with a new man in the role. This wasn't the only change to the series. For the first time, the programme wasn't broadcast on a Saturday evening. Instead the show moved to week nights. Not only that but it was broadcast twice a week. On the plus side this meant more Doctor Who each week. On the other hand, it meant that the season was over in half the time, taking three months to complete rather than the usual six. 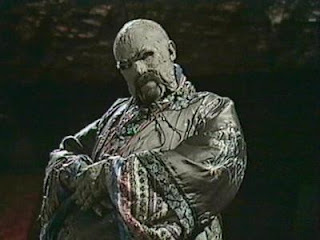 The opening story of the season was 'Castrovalva', which picks up where 'Logopolis' left off. The Master is still hanging around like a bad smell and trying to kill the Doctor - because doing it once and causing him to regenerate just wasn't enough. To start with he tries to send the Doctor (still weak from his regeneration) and his companions hurtling back to the creation of the Universe. When then doesn't work, the Master goes to a rather convoluted Plan B. The Doctor heads to Castrovalva, somewhere where he should be able to heal after his regeneration. But he discovers that the whole place and its people is an elaborate illusion concocted by the Master in order to trap the Doctor. 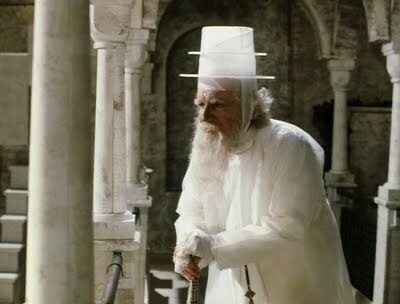 The Master himself is in Castrovalva (in one of his many cunning disguises), presumably to ensure that the trap succeeds. Of course it doesn't and the Master finds himself caught in his own trap while the Doctor and his friends make good their escape. The running theme for the remainder of this season was the Doctor's attempts to take Tegan back home so that she can catch her flight out from Heathrow Airport. 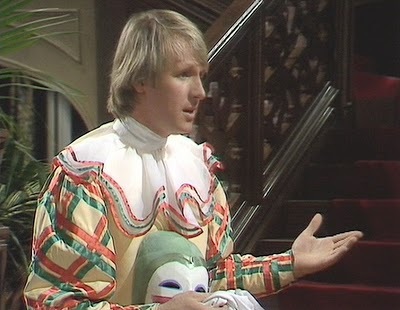 Unlike Nyssa and Adric, Tegan is not travelling with the Doctor through choice. She's a working woman with a home and career who has stumbled, literally, into the Doctor's world and doesn't want to be there. It explains a lot of the character's anger and aggression throughout the season. The first attempt to take Tegan home in the next story, 'Four to Doomsday' sees the TARDIS land on board an alien spaceship orbiting the Earth. The spaceship belongs to a group of aliens who have been travelling between Earth and their home world for thousands of years, picking up representatives of human life on each visit. Now they've returned for the last time and want to take over so the Doctor and his companions have to stop them. At the end of 'Four to Doomsday', Nyssa suddenly collapses, supposedly due to exhaustion. As a result she only appears very briefly in the next story, 'Kinda', as she's sleeping in the TARDIS for much of the story. Nyssa's absence means that the story is able to focus more on the other members of the TARDIS crew, notably Tegan. 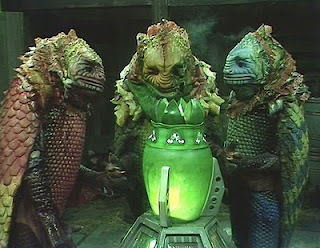 The TARDIS crew is on the jungle planet of Deva Loka along with a group of Earth colonists. The planet is also home to a seemingly primitive tribe called the Kinda. Tegan, meanwhile is possessed by an alien entity called the Mara that exists in the subconscious and wants to enter the real world. The Mara tries to use Tegan to take control of the Kinda and use them to destroy the colonists. 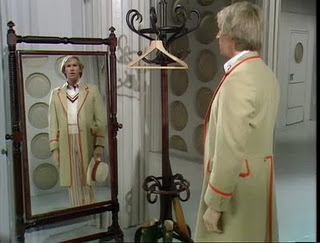 The Doctor comes up with an idea to drive the Mara back to where it came from by trapping it within a circle of mirrors as, apparently, the one thing that evil cannot stand is its own reflection. The plan works and, briefly, we see the Mara's true physical - a giant snake - before it disappears back to where it came from. 'The Visitation' is another attempt by the Doctor to take Tegan back to Heathrow in the early 1980s. It's also the first full-on trip into the past since 'Talons of Weng-Chiang.' On this occasion he gets the right place but they arrive but around 300 years too early, in 1666. Rather than an airport they discover leafy forests and manor houses that have been taken over by a group of aliens called Terileptrils. These particular Terileptrils are escaped criminals who have decided to wipe out human life with a variation of the Black Death. 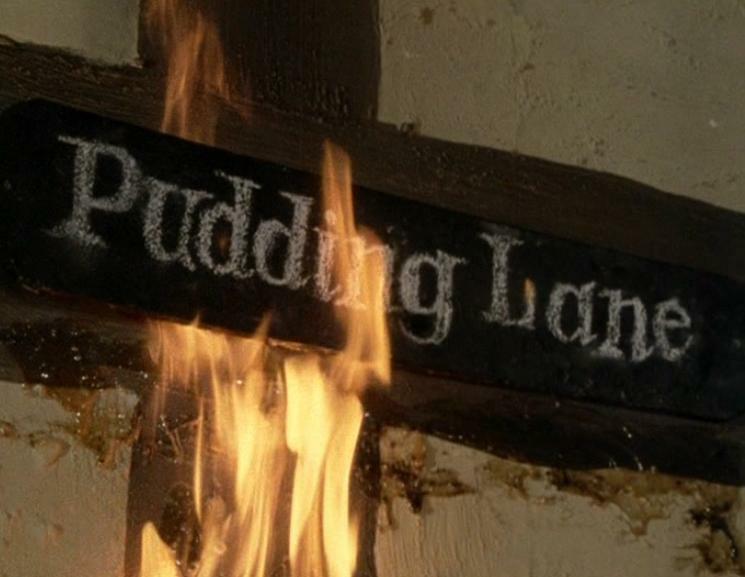 The Doctor stops them of course but inadvertently starts the Great Fire of London. 'The Visitation' is also the story where we say goodbye to the sonic screwdriver for a while. Producer John Nathan Turner felt that the screwdriver, like K9 was too convenient a gadget for the Doctor to have. So he decided to get rid of it by having it destroyed by the Terileptril leader. Goodness knows what JNT would have thought if he'd seen how the sonic screwdriver is used nowadays. Staying in the past, 'Black Orchid' is the first 'straight' historical story since 'The Highlanders' in 1966. In other words it's a story set in the past but with no science-fiction elements at all other than the Doctor and his companions. Instead, this story - which is set in the 1920s - is more of a murder mystery in true Agatha Christie style. The Doctor and his companions arrive at a 1920s garden party hosted by Lord Cranleigh who is engaged to a young lady called Anne who just happens to be the exact double of Nyssa. Much of the first episode involves the Doctor and his friends dancing, eating, drinking and generally having fun at the party. It's nice to see them enjoying themselves and a refreshing change of pace. Of course things take a darker turn when a murder occurs and the Doctor is blamed. The Doctor manages to clear his name and discovers the real murderer is Lord Cranleigh's brother, a famous explorer who was left deformed and mad after one particular expedition. And so we come to 'Earthshock' - a story that has two big surprises that John Nathan Turner worked hard to avoid viewers discovering ahead of time. 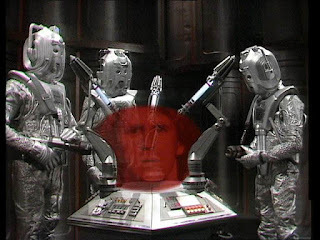 First and foremost, this story marked the return of the Cybermen, not seen since 1975's 'Revenge of the Cybermen'. So determined was he, that their return remain secret, JNT didn't use them or mention them at all in publicity for this story. So it came as a genuine shock to many when the re-vamped Cybermen appeared at the climax of the first episode. 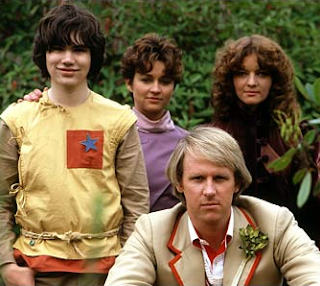 The second big shock was the death of Adric. Not since the mid-60s and the death of Katerina and Sara Kingdom had we witnessed a companion die. 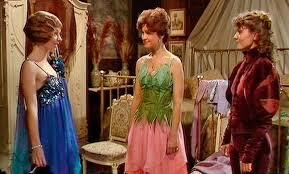 And neither Sara nor Katarina were as well-established characters as Adric. So to see him blown up saving the Earth from the Cybermen was quite a traumatic event for many viewers. 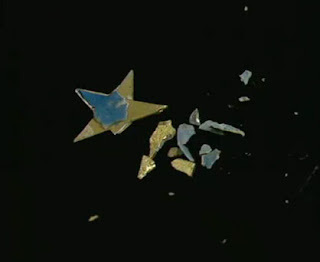 Just to hammer home how traumatic this event was, the end credits - for the first and only time in the series' history - rolled in silence over an image of the broken badge that Adric had worn throughout his time in the show. 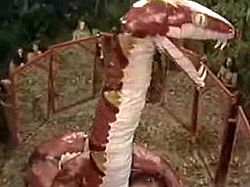 Adric's death also results in the destruction of the dinosaurs on pre-historic Earth. So, for the second time this season, we have an instance of one of the TARDIS crew being responsible for a major historical event. This story is an unusually violent one - seeming to take its inspiration from early-80s sci-fi films like Aliens. Guest characters seem to be killed off on a whim as a means of upping the stakes. Even the Doctor is seen to use a gun at one point. The story was written by the new script editor, Eric Saward and this more violent approach to the series will be seen in some of his later work too. The Fifth Doctor's first season comes to an end with 'Time-Flight'. The Doctor finally manages to get Tegan back to Heathrow Airport and then ends up being transported back to pre-historic Earth on a Concorde. Well at least he travelled in style. The Master is trapped on pre-historic Earth (having escaped from Castrovalva) and caused the Concorde to be brought there. He's wearing yet another of his cunning disguises, for no discernible reason - and needs the Doctor's assistance to harness an ancient alien power. Naturally the Doctor doesn't give his help and returns the Concorde and its crew to the present day. In a final, unexpected twist, the Doctor and Nyssa decide to go leave in the TARDIS without Tegan, who they believe is now happily returned home. However, too late, Tegan has decided that she likes travelling with the Doctor after all. 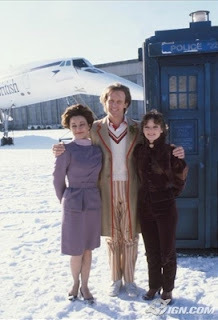 However the TARDIS departs before she can tell him and Tegan is left behind at Heathrow. Finally, the first Doctor Who videos were released in 1982. Not episodes of the TV series unfortunately but the two 1960s Dalek films starring Peter Cushing. Two records released this year. The first was the theme to 'K9 and Company', though quite why anyone would want to listen to this on a regular basis eludes me. The second release is a somewhat obscure comedy song called 'Doctor Who is Gonna Fix It' by Bullamakanka, an Australian country band. Up until now I'd never heard this song but it's rather fun so I had to share it. There were a number of new Target novelisations published this year. Terrance Dicks was, much to his relief no doubt, no longer writing the vast majority of the books. The new policy at Target seemed to be that the writers of the original TV scripts would be given the first opportunity to novelise their own stories. If they chose not to then Terrance Dicks or one of the other regulars like Ian Marter would be asked to write them instead. 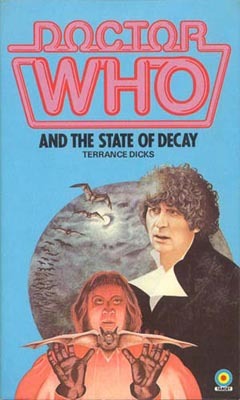 Dicks novelised his own State of Decay (quite different to the audio book released the previous year). The Keeper of Traken and The Sunmakers. Meanwhile original script writers, Stephen Gallagher (using a pen-name), David Fisher, Andrew Smith, Eric Saward and Christopher H Bidmead novelised Warrior's Gate, The Leisure Hive, Full Circle, The Visitation and Logopolis respectively. 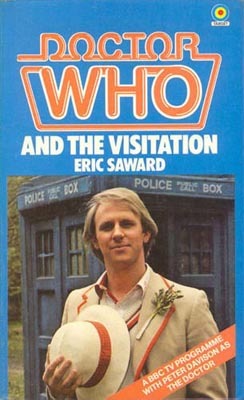 The Visitation, coming out a mere six months after it's TV broadcast, was the first Fifth Doctor novelisation. To differentiate the Fifth Doctor books from the rest of their output, Target chose to use photographic covers rather than the usual artwork. This made for some uninspiring covers, mostly consisting of publicity stills. Some of the covers were better than others with The Visitation being one of the better ones. Speaking of Peter Davision: he lent his name and face to a 'Book of Alien Monsters'. Much like the Jon Pertwee Book of Monsters back in the Seventies, this was a collection of short stories, totally unconnected to Doctor Who. 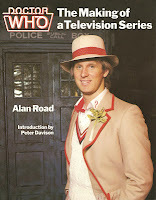 Davison also appeared on the front cover of 'Doctor Who: Making of a Television Series'. This was a children's book that went behind the scenes of Doctor Who, specifically the making of 'The Visitation'. This was a book that I loved as a child and I still own a copy of it now. 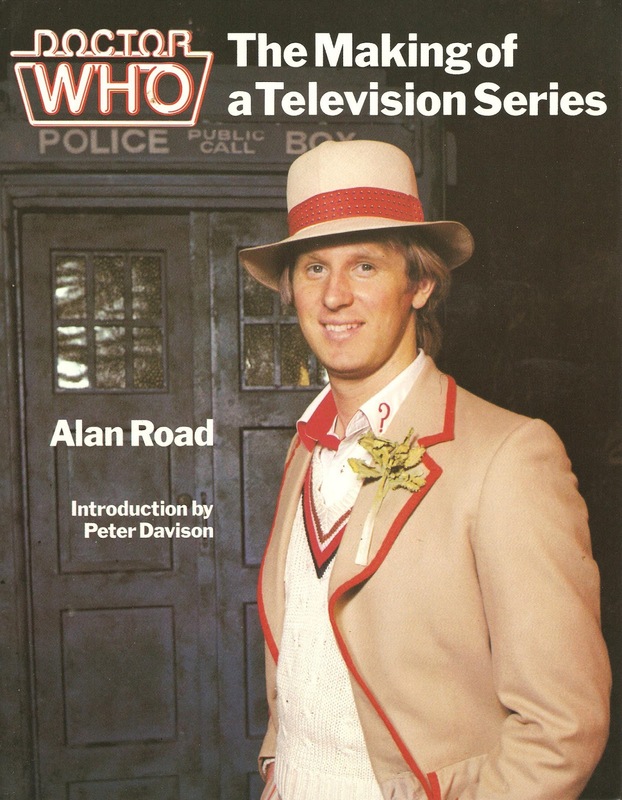 Finally, 1982 also the release of a Doctor Who Crossword Book as well as a Dinosaur Quiz Book. Not to mention the latest Annual, joined this year by a separate K9 Annual. This was presumably to tie in with K9 and Company but it rather missed the boat by being a year too late. Doctor Who Monthly went from strength to strength in 1982, even picking up a prestigious Eagle Award for best comic magazine, a fact that it proudly boasted on the cover of issue 61. 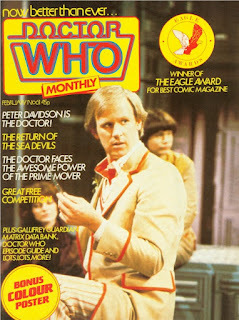 Unfortunately, and ironically, the cover of issue 61 also contained a rather obvious spelling mistake as it proclaimed -in big letters - 'Peter Davidson is the Doctor'. There was an increase in the number of written features which meant that the back-up comic strip (featuring monsters and allies from the Doctor's past) were gradually phased out over the course of the year. The main comic strip, however, continued now with the Fifth Doctor. Steve Parkhouse, the current writer, created a loose trilogy of stories that ran across the year. All three stories were set in a small fictional village called Stockbridge where the Doctor (travelling alone unlike his TV counterpart) is currently holidaying, enjoying the scenery and playing lots of cricket. The first part of the trilogy was an epic 7 part story called 'The Tides of Time' and - in terms of page count - was the longest Doctor Who comic story to date. The story sees a demon called Melanicus escape from another dimension and take control of a device called the Event Synthsizer that controls the flow of time. Using the Synthesizer, Melanicus caused chaos in the Universe and only the Doctor can stop him. Fortunately the Doctor is not alone, aided by a knight who is lost in time called Sir Justin and a mysterious being called Shayde who is a creation of the Time Lords, sent to aid the Doctor. 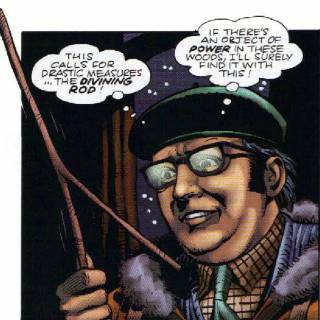 including Merlin (tying in with the Fourth Doctor's final comic strip story) and it's this council that send the Doctor off on his mission. Aided by Sir Justin and Shayde, the Doctor confronts the demon and defeats it, restoring time to its proper course. Sir Justin, however loses his life in the final battle and Shayde also departs, his mission completed, leaving the Doctor alone again. He's not alone for long though, as the second, and far more straightforward story in the trilogy 'The Stars Fell on Stockbridge' introduces us to UFO enthusiast and general eccentric, Maxwell Edison. Considered a bit of a loser by the other villagers, Max's luck is in when he first meets the Doctor (a genuine alien!) and they then both explore a supposedly haunted spaceship orbiting the Earth. This story is a short one and, truthfully, very little of consequence appears to happen. The Doctor and Max explore the haunted ship find nothing and return to Stockbridge. However this story is really just a prologue to what happens next. This story also marks the departure of Dave Gibbons as artist on the strip. The final panel of his final strip sees Maxwell Edison riding off into the distance under a starlit sky, quite appropriate as Gibbons was himself heading off to pastures new.